We use only clean ingredients. We never use synthetic solvents like hexane, methanol and petroleum either. And, we don't add unnecessary binders, fillers, colors, or preservatives. Our Saw Palmetto extract is prepared from ripe berries that are bursting with the fatty acids and related therapeutic compounds clinically shown to support prostate function. 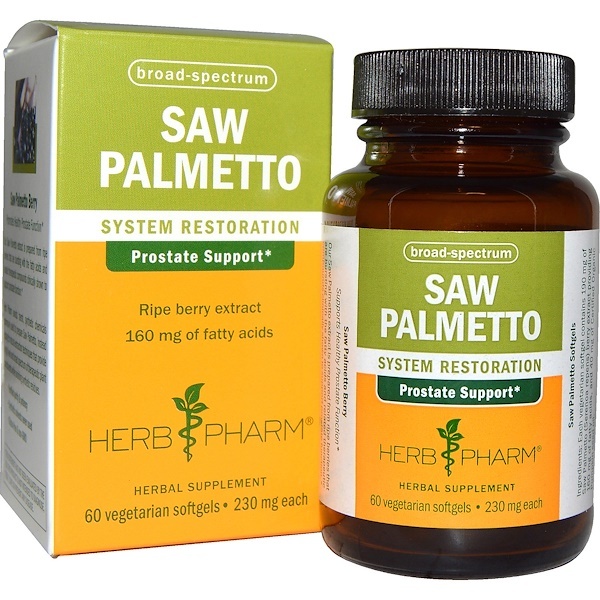 Herb Pharm avoids harsh, synthetic chemicals commonly used to prepare Saw Palmetto, instead opting for natural extraction techniques that provide a high level and broad spectrum of therapeutic plant constituents while avoiding synthetic residues. Take 1 softgel, 2 times per day. Best taken with food. 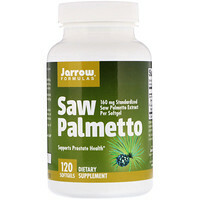 Каждый вегетарианский softgel содержит 190 мг Saw Palmetto (Serenoa repens) ягодный экстракт, содержащий 160 мг жирных кислот и 40 мг сертифицированного органического семенного масла тыквы. Вегетарианские мягкие гели производятся из модифицированного пищевого крахмала из кукурузы, не содержащей ГМО, морских водорослей, глицерина, сорбита и очищенной воды (без желатина). Don't use if lid seal is broken or missing. Keep bottle tightly closed and store in a cool place.